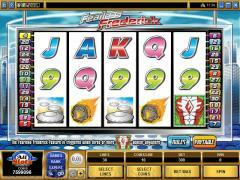 Fearless Frederick is a video slot from Microgaming. It has 5 reels, 30 paylines and a maximum bet of 300 coins. The game has a superhero theme, with Fearless Frederick being the superhero. The symbols on the reels help create the theme. The main symbols are Fearless Frederick, which is the wild symbol, and the FF logo, which is the scatter symbol. The other symbols on the reels are the Girl, the Automobile, the Meteor and the UFOs. The symbols have been created in a caricature style. The high card values from Nine to Ace are also represented. 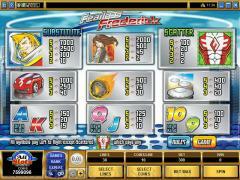 The FF logo symbol activates the Fearless Frederick feature, in which players can win either cash prizes or free spins. 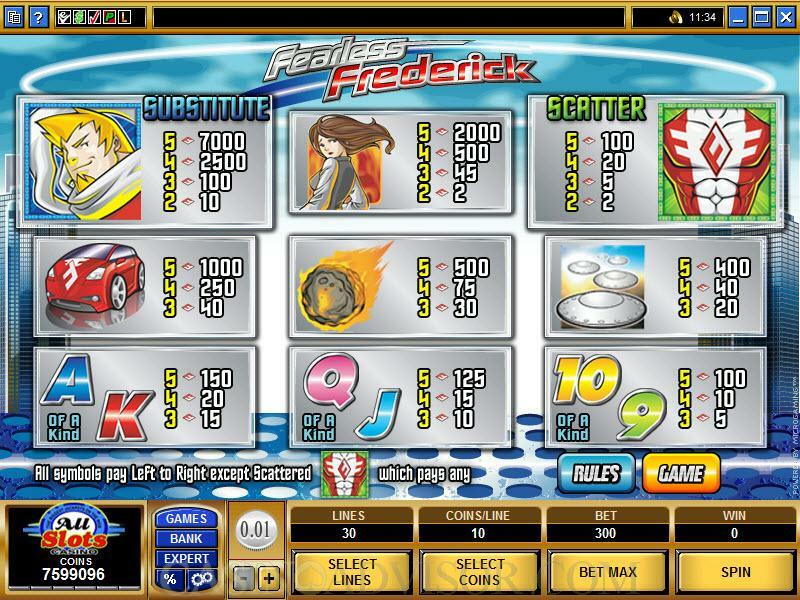 Fearless Frederick also has the trademark Microgaming Gamble Feature. Before starting the game players will have to choose the coin denomination by operating the +/- signs below the coin denomination button. Coin denominations are 0.01, 0.02, 0.05, 0.10 and 0.20. Players will also have to enable up to thirty paylines by operating the +/- signs below the LINES button. Winning combinations pay only if they occur in enabled paylines. Finally players will have to choose the number of coins per line by operating the +/- signs below the COINS/LINE button. In Fearless Frederick players can wager up to 10 coins per line. Once the settings have been completed the game can be started by clicking the SPIN button. Fearless Frederick is the wild symbol. Whenever it substitutes for any other symbol to make a winning combination it doubles payouts. 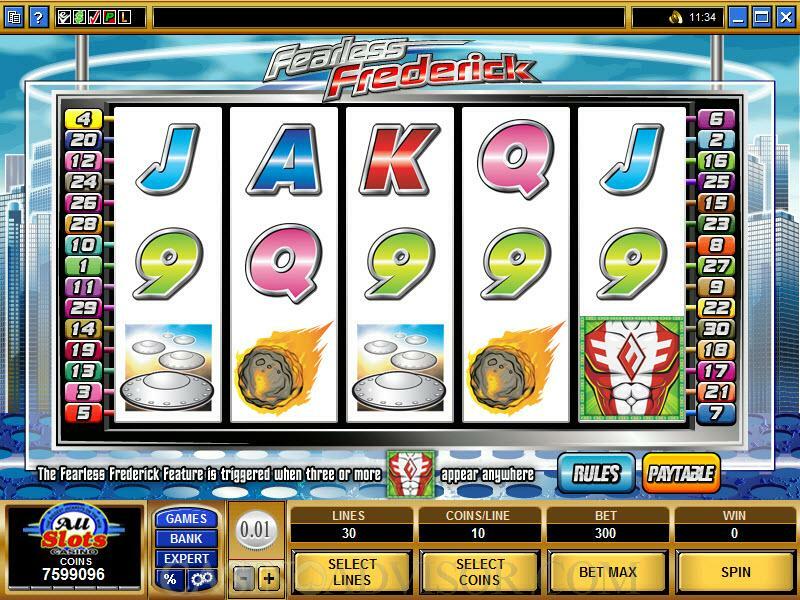 It also offers a fixed jackpot of 7000 coins when five Fearless Frederick symbols appear in an enabled payline. The second highest jackpot of 2000 coins is offered when five Girl symbols appear in an enabled payline. The FF logo is the scatter symbol. Two or more scatter symbols result in scatter payouts. Five scatter symbols have a payout of 100 coins. The Fearless Frederick Feature is triggered when 3 or more scatter FF logo symbols appear anywhere on the reels. The players have to choose one from the three given heroic deeds for Fearless Frederick to perform. If Fearless Frederick is successful in his mission players will get a random number of free spins or a random bonus amount. The wins in the free spins are at tripled payouts and should three or more scatter symbols appear during free spins the same number of free spins are retriggered. If Fearless Frederick fails in his mission then the player gets a consolation prize of two times the triggering bet. Interested in reading more detailed information about Fearless Frederick? If so Click Here for more details.